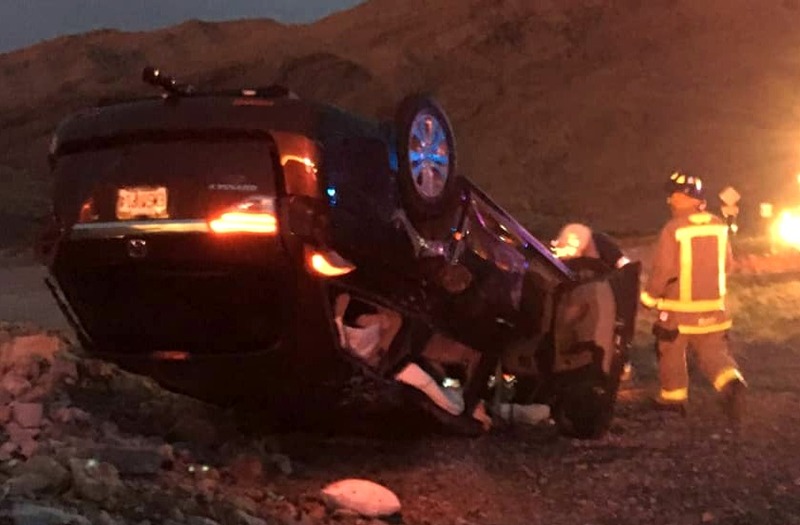 ST. GEORGE — Arizona troopers say seat belt use saved a couple’s life after a violent rollover on Interstate 15 near the Virgin River Gorge destroyed a minivan Sunday. 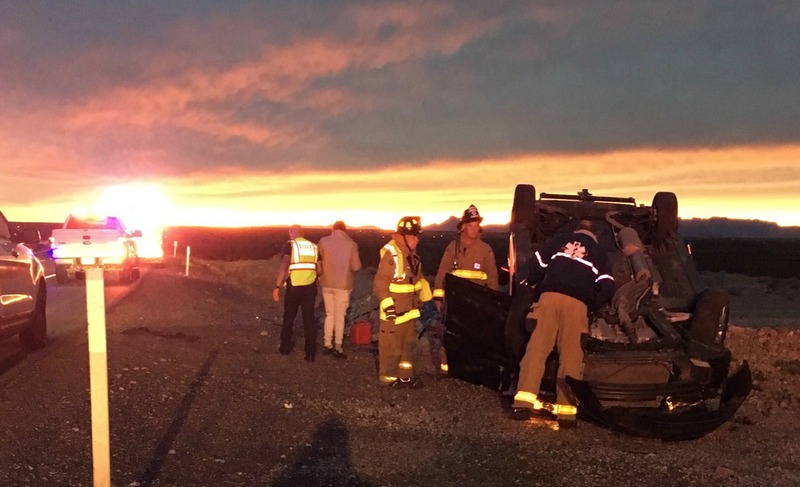 At about 6 p.m. MST, troopers and emergency personnel were dispatched to the single-vehicle rollover involving a red minivan on northbound Interstate 15 in Arizona near mile marker 12, Arizona Department of Public Safety Highway Patrol trooper Tom Callister said. Arriving emergency crews found the overturned vehicle several feet from the roadway on the southbound side of the interstate. The two occupants had to be helped out of the vehicle by firefighters but suffered only minor injuries. The pair were treated by EMTs at the scene but declined to be transported to the hospital. At the time of the rollover, Callister said the driver failed to negotiate a curve in the road, and the vehicle went off the shoulder to the right. The driver then overcorrected to the left, which caused the minivan to veer across both northbound lanes where it crossed the median and rolled multiple times across both southbound lanes until it came to rest upside-down off the shoulder. “The minivan cut a cataclysmic path across all four lanes of I-15 dodging traffic, and it made it through without being struck by any oncoming vehicles,” Callister said. “I’ve seen crashes that were not nearly as severe as this one where the injuries were extensive,” Callister explained. The driver was cited for speed not prudent. The minivan was destroyed in the rollover and was later towed from the scene. Does anyone know whether the driver’s text message arrived safely to its destination? There were a couple bad typos! I know, aren’t I amazing?? Nice try, but I’m saving the lottery numbers for myself. All of Cody’s stories are fantastic. She has a great talent for painting a complete picture of an event. I almost feel like I was actually in the accident, but without the injuries or the citation. St. George News is lucky to have her. Thank you for your kind words. She does indeed paint a picture, and beyond that, she is an amazingly hard worker who always shows up and gets the job done, even if it means staying late to make sure the story gets out to our readers in a timely fashion. We do appreciate her, but I think it’s often better to hear it from readers. I’ll make sure she sees your comment. She might not want a compliment from me, Paul. I’m known around here for being a terrible misogynist, and if she’s read others of my comments, she might not care what I think. But you can tell her that 90% of my misogyny is just strategic push-back against the current over-empowerment of women, and I am indeed a Cody Blowers fan. You are far too reserved, Nick, go ahead and admit you are the neighborhood curmudgeon. Sounds like Cody Blowers might have a new stalker, ahahah. But yes, she does do a good job. I forgot her name, but that dark haired gal that used to write for stgnews did excellent work as well, but she must’ve left the company some time ago. Just normal, southern Utah driving.